Thankyou everyone & why I am staying here? I am looking for new animators. You need to have at least 4 years Maya experience animating, school experience counts. You need to be fast and willing to learn. If you are a CG student near Tokyo or interested in CG consider coming over as an intern and see what we do. Your country, age, gender is of no concern, but you must live here near Tokyo and have a valid visa for working. We had Mihashi from Digital Domain over at my companies year end party. 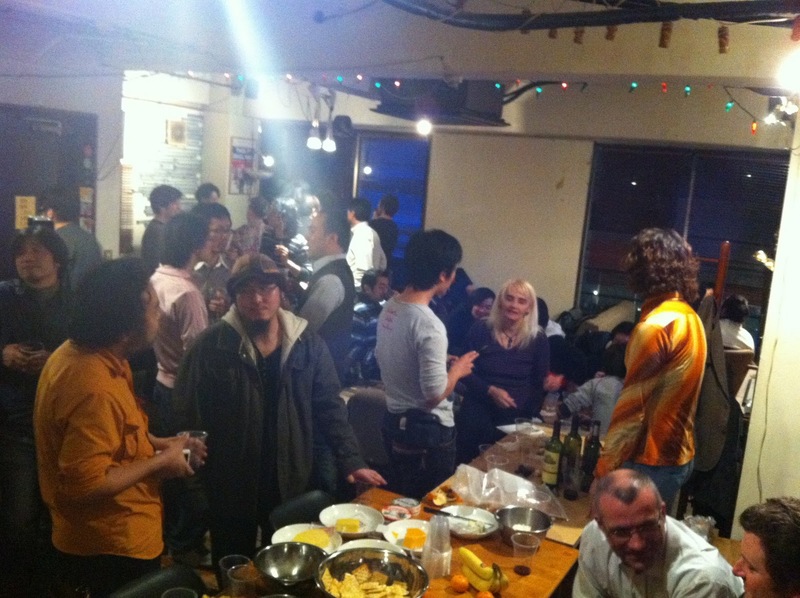 Nibbles and wine with way too many people for the size of the room, but it was one of the best TokyoGAF parties yet. After this booze up, those still standing went clubbing. Spent half the day trying to fix a broken network on a brand new iPhone 4s. And now for the details. Woke up this morning connected to my home wifi, no probs. As soon as I left the house I couldn't connect despite a full (KDDI) antenna signal and a 3G icon. Phone was fine, just mail, and all web access couldn't connect. 1. Stop and start network via airplane mode. 4. Then I was told to reset the phone to factory & restore from an old backup!!! so I went back to the office ready to do that meanwhile losing a week of setting up this baby. Awful. Did that and got connected! Until I left the office, when my office wifi was out of range I was off the net again. Went to various meetings by calling friends and asking them to get addresses where I had on my net based contacts! Finally I went to a KDDI shop, they went thought exactly the same as above, finally telling me I had no choice but to go to Apple. Typical pass the blame game. Then on the way back I just tried the reset-all trick above and it worked. The actual prob I have not pinpointed but for now if you are suddenly left without a net try it it may save you a lot of trouble. If you are not a Redhat or debian user, eg. LFS/Gentoo or a DIY system like me and wanted a runscript.sh style startup for Houdini's Hqueue here is a working server startup. The following wont work with g++ version >=4 (which is default). You will need make and g++-3. Regarding the current situation in Japan. Thank you so much to everyone who has commented and helped over the last few days for your support, trust me when I say your words have been a fountain of strength. I have had a few comments from friends, family, even people who work for me why I don't go with all the other foreigners on a plane outta here. How would you feel if during an emergency your boss just jumped the next plane because he could? People are willing to work for me even under these conditions, what kind of man would I be to run? I would like to think my parents brought me up a better man than that. We were thirty percent into a production when the first big quake hit. You may have all thought I was tweeting panic regarding my life. Quite the contrary, I was worried we would not make deadline. When I sign a contract I really mean it, ask anyone who has worked for me. I expect total dedication to whatever we are working on. I give that dedication, I expect the same in return. As long as the people I care about are relatively safe, we can make some good films. A friends grandad who died at 98 a few years ago, walked through Nagasaki day after it was bombed, smoked 2 packs and drank 1 sho(1.8 litres) of sake every day. I can handle a few rads. Sure I am pissed about the current predicament, but that just strengthens my resolve even more. Please focus on the people who have lost loved ones. I'm still fine and I'm gonna stick by the people willing to put their neck out for me. If there's limbs missing or a mushroom cloud I might get on a plane, otherwise the show must go on. unfortunately we all don't use Redhat, and so the startup files for tractor wont run. Here is my own startup scripts for Pixar's Tractor tested on my own server and Gentoo. and here is the tractor-engine script, save in /etc/init.d/tractor-engine. eerror "You need exec file "
I am looking for a new assistant for 2 months. You need to have at least 4 years Maya or Houdini experience modelling, animating and scripting, school experience counts.